We love the Ian Potter Children's Garden in Melbourne so when we heard about the Ian Potter Children's Wild Play Garden opening soon in Sydney, we were very excited! The construction of the Ian Potter Children's Wild Play Garden started September 2016 and is planned to be completed by October this year weather permitting. The Garden is not just another playground or picnic area, but a purpose-built, state-of-the-art facility aimed at providing children opportunities to reconnect with nature at a time when many have rapidly decreasing access to nature and the outdoors. The Ian Potter Children's Wild Play Garden will provide an outdoor learning experience for children aged 2-12, of all abilities and backgrounds, enabling a 'whole-of-life' approach to education. 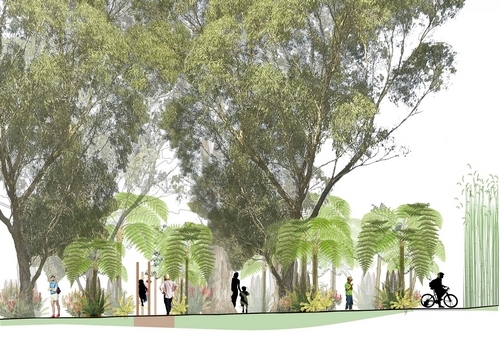 Located adjacent to the existing Education Precinct off Dickens Drive in Centennial Park, the Garden will consist of dedicated natural spaces including Artesian water play, creek beds, bamboo forests and outdoor classrooms, all designed to inspire and encourage children to engage in exciting, creative and imaginative outdoor 'wild play'. play spaces that respond to and enhance the existing Park’s landscape character. It will create 'nature smart' kids, build and strengthen an 'outdoor, nature focused' community and enable 'nature-based' play. Wild Play areas and Nature Art Space ... wow! Oh my, the Ian Potter Children's Wild Play Garden sounds amazing, we cannot wait to visit when it opens!! For more information on the Ian Potter Children's Wild Play Garden, head to the Centennial Parklands website.